A week after a federal judge in California ordered the Trump administration to reunite more than 2,500 children with the migrant parents they were separated from at the U.S.-Mexico border, hundreds are still in federal custody. A tally by WNYC found at least 52 children remain in foster care or shelters in New York. There are likely more but how many is unclear, though the number has fallen since Mayor Bill de Blasio said there were about 100 last Thursday. WNYC was provided with the numbers of children still represented locally by the Legal Aid Society and other non-profits including The Door, Kids in Need of Defense and Safe Passage Project. But Catholic Charities declined to give us any data, citing its need to respect the privacy of the group's young clients. Likewise, Safe Passage would only confirm that at least nine of its original 62 clients are still in New York. Those nine clients sued the government so they'd have more time to explore their legal options. According to the complaint filed in federal court, they include a nine year old girl from Honduras who wants to join her father if he's released from detention. But if he's deported, she's afraid to go back because she described being sexually abused by a man in her town. 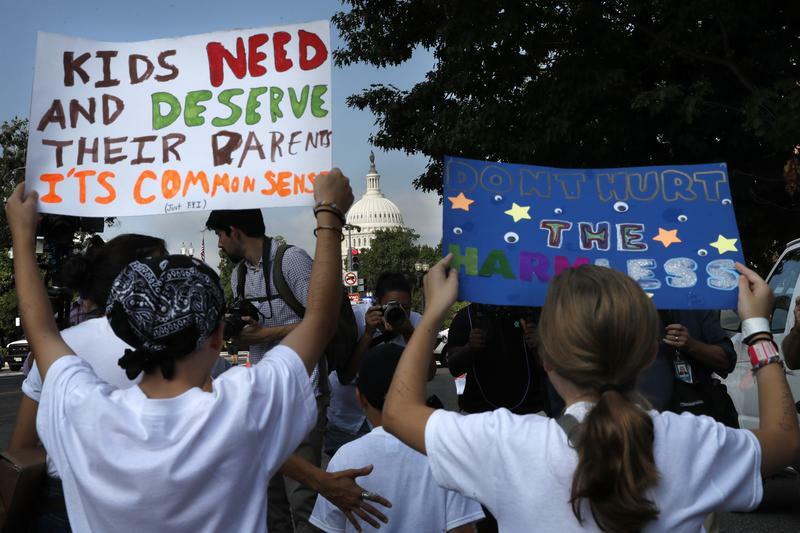 Other kids don't want to join their parents if that means going into family detention centers. The Legal Aid Society brought a similar suit but said its plaintiffs have since been reunited with their parents. For the most part, the children who remain in New York either have parents who were deported or who have what the government calls, "red flags", which includes criminal convictions. The government considers people with criminal convictions ineligible for reunification. But during a status conference Friday, ACLU attorney Lee Gelernt said in one case, a parent's criminal conviction was for a theft that happened 12-years-ago in their home country. "If that is the only information the government has we would ask the government to reunify," he said. Judge Dana Sabraw rejected the government's request to make the ACLU primarily responsible for finding parents who were deported without their children. He said hundreds of parents have not been located as a result of the government's failure to track the families they separated. "For every parent who is not located, there will be a permanently orphaned child and that is 100 percent the responsibility of the administration," Sabraw said. The Judge ordered the government to select one or two people who can take charge and be held accountable for finding deported parents. He also ordered them to give the ACLU the case files of children in the custody of the Office of Refugee Resettlement. The ACLU said the files likely contain the phone numbers of deported parents. Anthony Enriquez, director of the Unaccompanied Minors Program at Catholic Charities in New York, said that it was frustrating to see how little the government was doing to facilitate reunifications, even though the child's caseworker at their foster care agency usually knows how to locate the parent, as does the Office for Refugee Resettlement. He said the lack of cooperation was affecting his cases when kids go to immigration court. "That government attorney is saying 'they're not eligible and we're not going to lift a finger to reunite them. We're just here to deport this child so that's that,"" he said. The children are not being deported, however, when they go to immigration court hearings in New York. Judges adjourn the cases for several months unless a child requests a voluntary departure to join a deported a parent. Enriquez said Catholic Charities' attorneys tell their young clients they're fighting as hard as they can to reunite them with families or represent them in other ways, such as seeking asylum independently. But the kids are aware that other children have been reunited with parents while they're still kept apart from their mothers or fathers. "There's unfairness," he said. "There's the question of 'when will this moment come for me?'"